This treat is perfect for upcoming summer cookouts! I sent these to work with Mike and well yeah, his co-workers LOVED them! Embarrassed at the sloppiness... shame. First, pair up your wafer cookies. Make sure you have enough pairs for each of the Grasshoppers. Next, tint some of your frosting orange, like cheese! Spread this on one of your cookies. I like to use a decorator bottle because it takes minutes to do and is way less messier! But, see the pic below? Yeah, use about twice that amount of icing. Place your grasshoppers on top of your icing cheese. Had I used more icing, my cheese would have shown a little more. Then, tint some more frosting red for ketchup. Squirt this on your burger cookie. Next, add a few drops of green food coloring to the shredded coconut. Cover and shake it baby, shake it! Now you have lettuce! Add a little more "ketchup" to the top "bun" so it will stick to the coconut. Lastly, paint the top bun of your burgers with egg white and sprinkle with sesame seeds. If you're one of those moms that are against raw eggs and don't even let the kiddos eat cookie dough (not saying there is anything wrong with that! ), you can use orange juice concentrate instead of egg whites. There you have it! 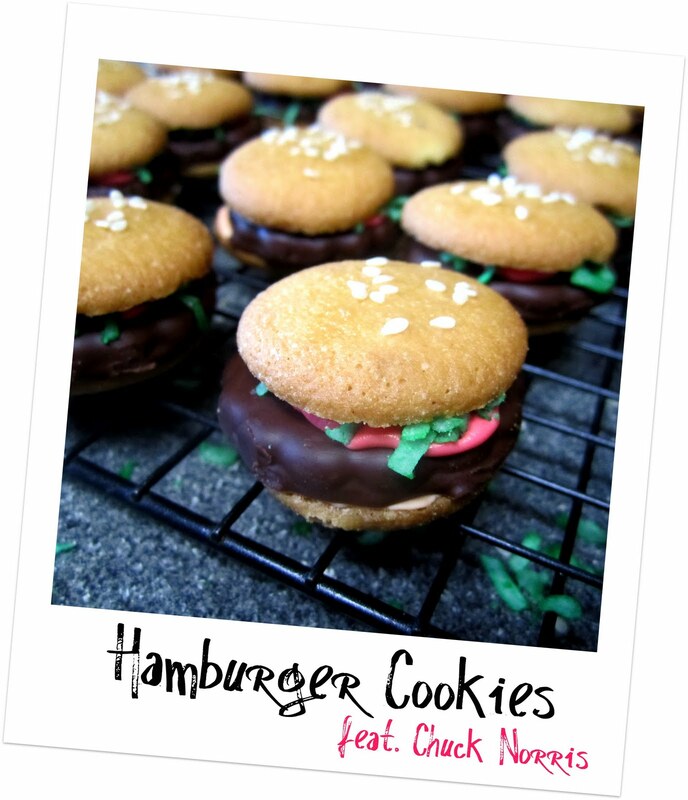 Itty bitty burger cookies! We went to the store this week and I scanned another box... same thing! So weird. I'm linking this to my favorite linky parties! Totally kidding of course. I have kitties too, and the things I let them do is just plain wrong. Very funny, Tia! That is Jude's special treat bowl. He gets it on his birthday and holidays :o) My fat cat eats WAY more than that little dish can hold on a daily basis! I noticed that in the pic, too. Can you make mine a double cheeseburger? hold the lettuce, please! What is the app?? I love that it gives you the WW points!!!!!!!!!!!!! LOVE those cookies! And yes, what's the app? I might need to check into that! The app is called WWScanCalc. It's free and I think it calculates the new points plus because on some items, it is one point more than when I figure it with my WW calculator. CAT BOWL! Busted!! ;) I am in awe of how much time you spend on making adorable foods. It's admirable and these are darn cute, but I have to say it would irk me to know that the time I spent on these far surpassed the time it took to eat them. I feel this way about your awesome penguin olive cream cheese appetizers as well. ....Can we make these into a book, I wonder? I say "we" because if that happens, I am going to be your manager. Of course. They really didn't take that long! Well, I guess the FIRST time I made them, they took me hours. This time, about 20 minutes! Book? Let's do it! These are so dang cute!! Love them, and my kids will love them too :) Would love for you to link up with us tomorrow for our link up party!! Hope to see you there.